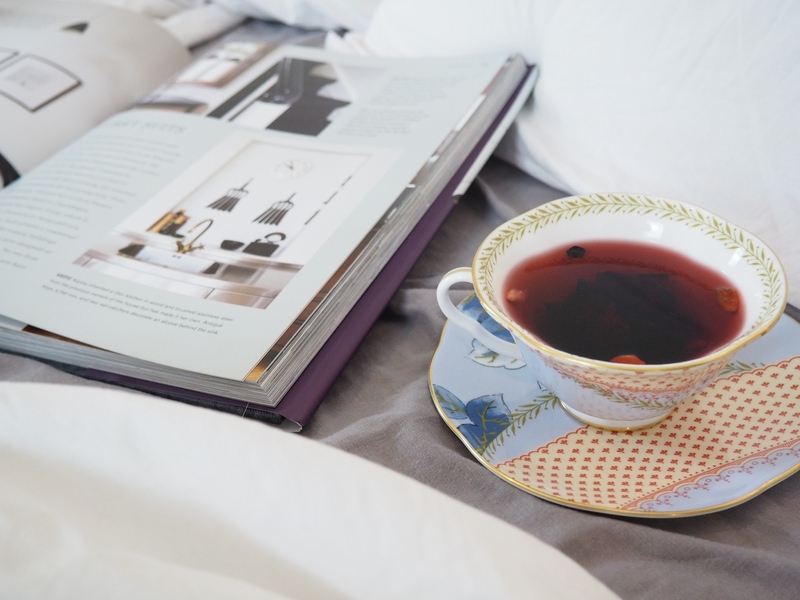 Winter is the time when I not only try to cosy up my living room but also my bedroom. 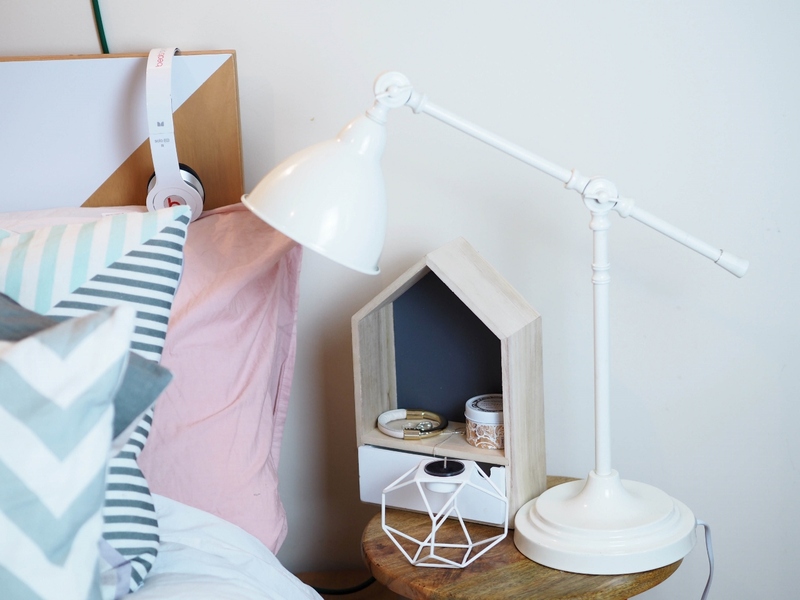 I have took part in Ocean Loans project to show you that you can re-decorate your bedroom for £50! All it takes is a little bit of imagination, motivation and accessories! If you look into old pictures, I didn’t change much! Literally, all is down to the right accessories! First up, I have brought into the bedroom my faux fur throw I bought previously in Primark for £12 , it already gave the impression of looking more warm. 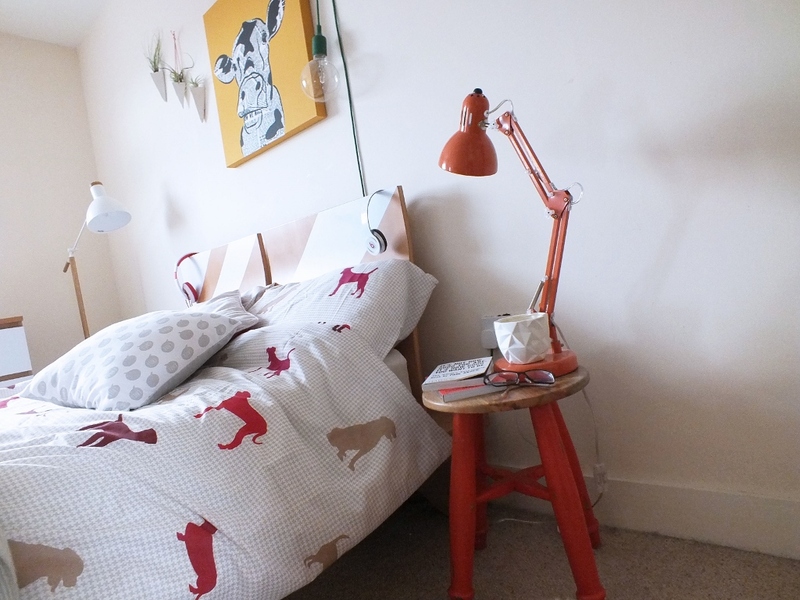 I have very orange side table and desk lamp, this was for my summery theme of colour pop but I needed to change that. So, I went to Dunelm to do some shopping. Guys, I felt like a child in Disney store! They have cool stuff, for really affordable prices! I was impressed! Many items I’ve seen there, you can find similar with huge price tag, and here I actually you will get similar items half the price. I mean I do love Fermliving or Bloomville but I am not going to lie, I can’t afford to pay for it. I know ‘Design is for Life’ and as much as I wish to have great designer pieces at home, for now I am trying to get the place looking topamax authorized generic like ‘’home’’ without breaking into bank! 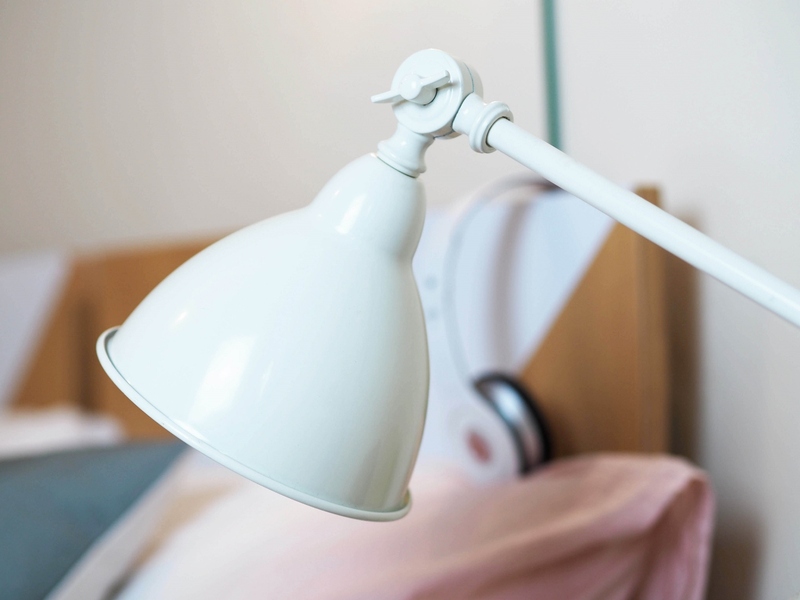 I have bought these stunning site table lamp for only £29 at Dunelm! 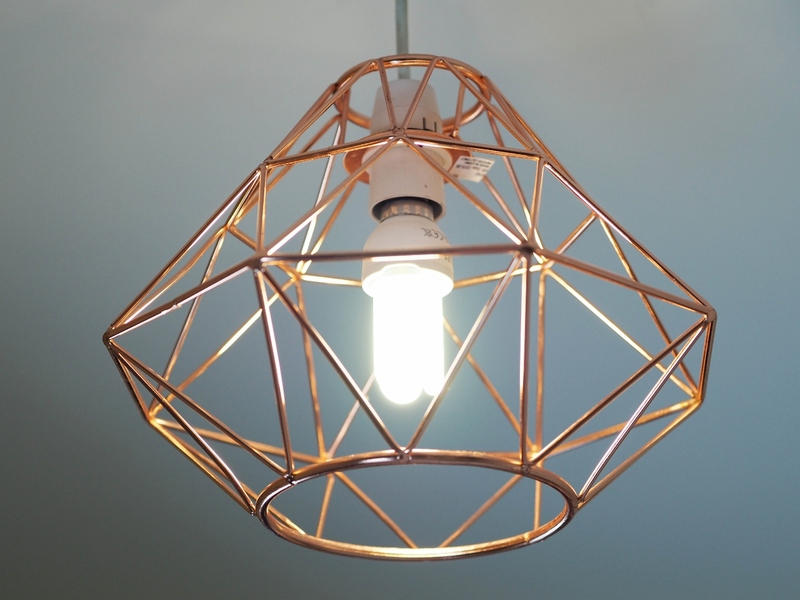 I badly wanted copper one but I decided go for copper on my ceiling! £19! You probably seen the inspirations of copper bits on my Instagram now! I have such a great copper crush! 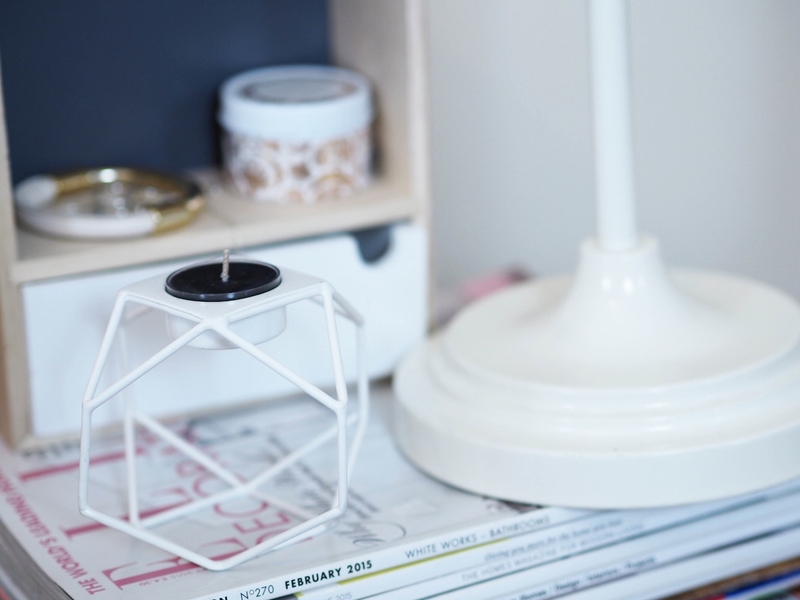 Next, I bought these geo tea light holder! I think is great for small spaces as you can see through and it doesn’t take up the whole space of the ‘’table’’ area. 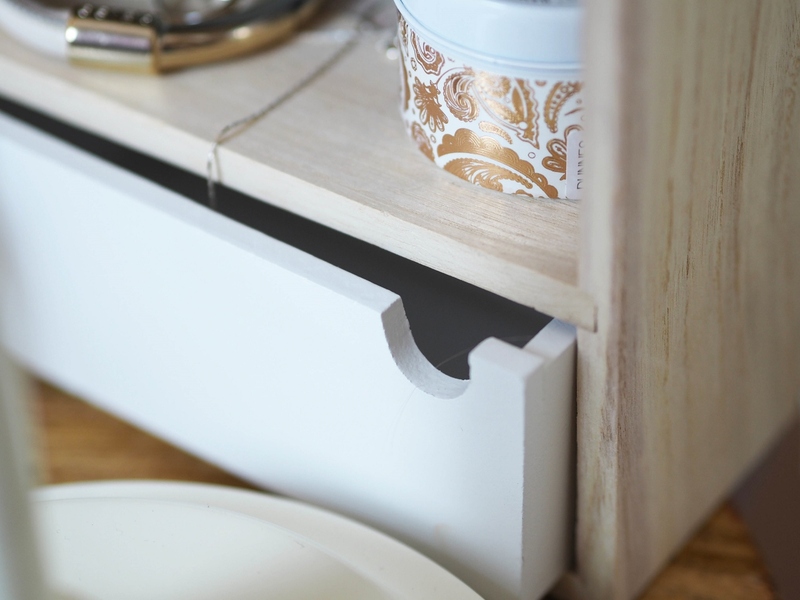 The jewellery-box with drawer was a huge hit! I totally love it! Great colour, design and so useful! 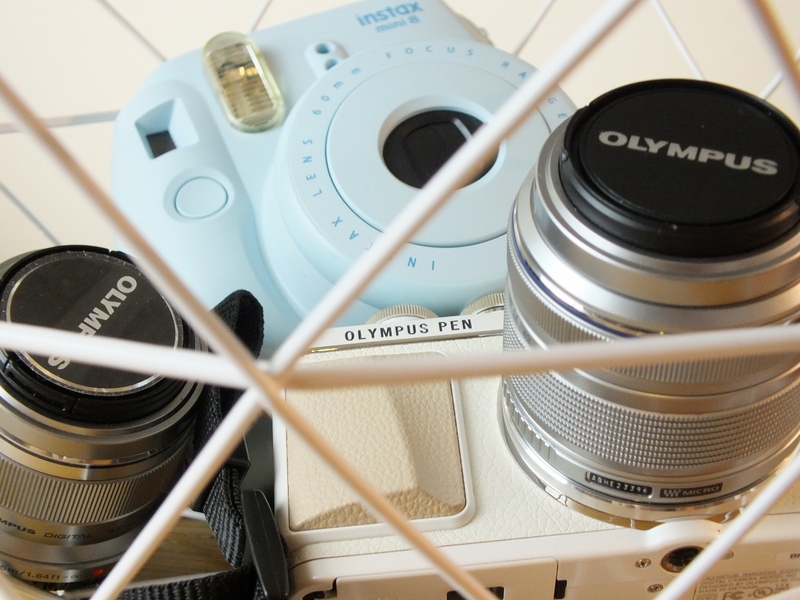 Last, I bought was the metal wire basket, this is I can keep my camera’s safe from my cats! Literally they like so rude sometimes 😉 Especially with my lens! If I leave it on table, Mia will ‘’accidentally’’ try to push it of! I like to have them on display and ‘’grab on go’’ style. I think the basket now is the perfect place! Especially, that I just invested in my new Olympus Pen EPL-7 ( which I pay in installments for it) so would be such a shame get it destroy it by cats! 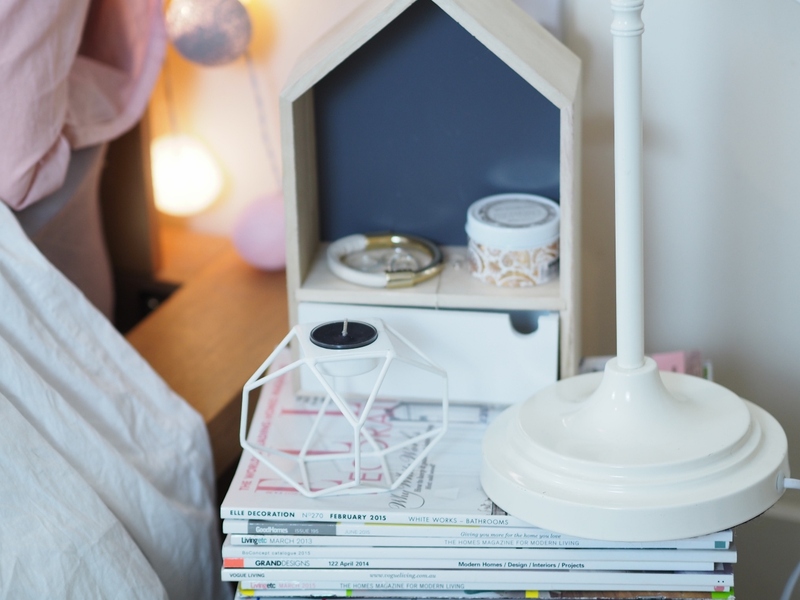 I couldn’t afford to buy new side table yet, so I have reused my old interior magazines to create this great effect! I have swap my Muuto lamp for these cotton balls lights (so much more Christmassy ). I am still very much on love with my The Great British Home cushions! 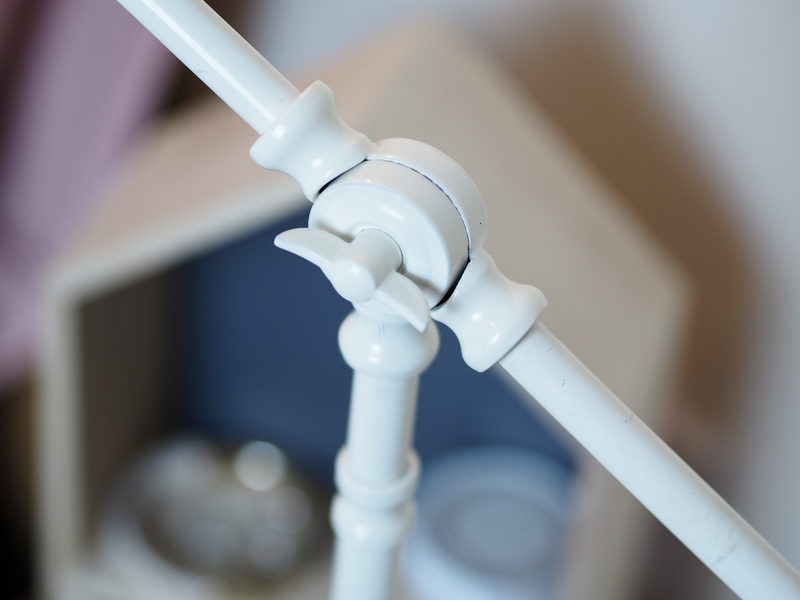 You can read about them in my 10 common bedroom decor mistakes post. You can see the before and after pictures! What you think? Which version is better? Where are your string lights from please? Definitely the "after" photographs! You have gone from "student digs" to "adult chic". Your blog looks like taking straight out of Pinterest! It's lovely! That faux blanket looks super cosy! Really love this post! The room is looking amazing and the before and after shots show how a few tweaks here and there can really transform a space! My favourite addition was the creative bedside table you made by stacking some magazines. OMG it looks so fab! Oh I love what you have done with the bedroom, it looks fab! Very lush! I love Dunelm products too! I feel the same when I go in! Haha. 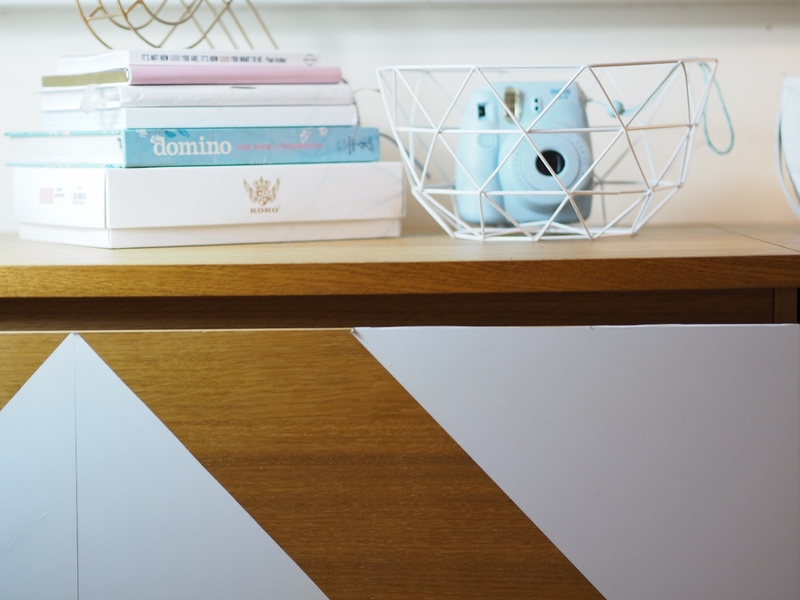 I love this look and really love the magazine nightstand! And the lamp is great too! Great inspiration for my new bedroom when we move thanks! 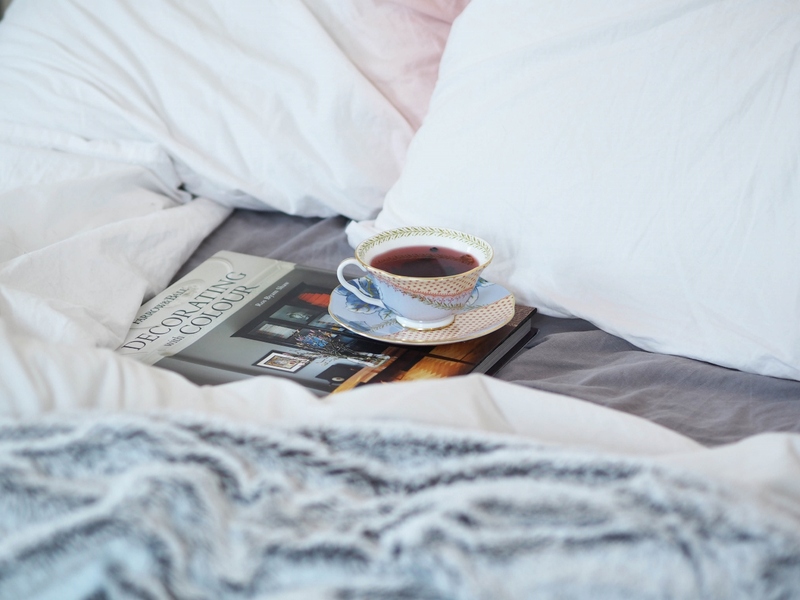 You've done a great job of making over your bedroom; it looks perfect for winter, warm and cosy! Hey Anna darling this post is perfection. I've been living in rented accommodation nearly 9 years and every place came with a different set of rules. Fortunately I've normally got unfurnished places except that is my current place and the furniture is so dark. Do you have any advice as a fellow blogger how I can lighten up my place? Oh wow I love this, I really like the colours you have used. 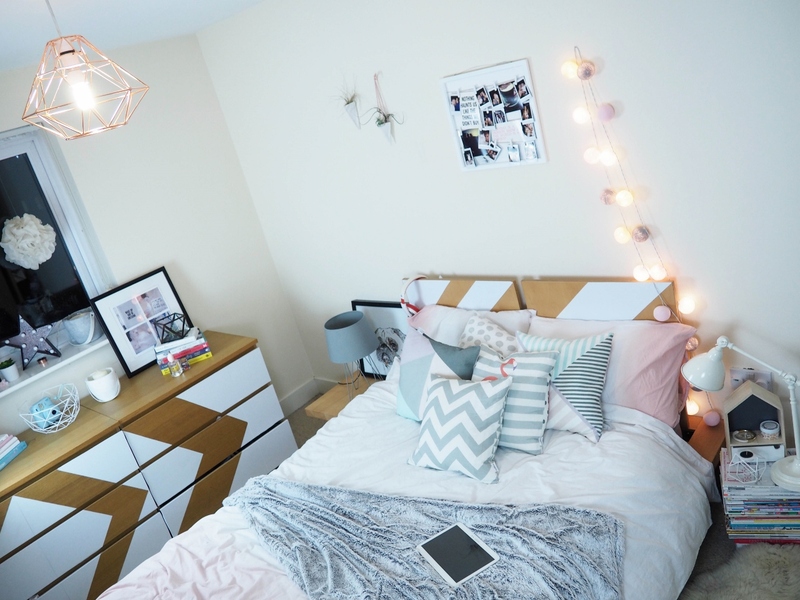 I really want to do a mini makeover on our bedroom and this is great inspiration! 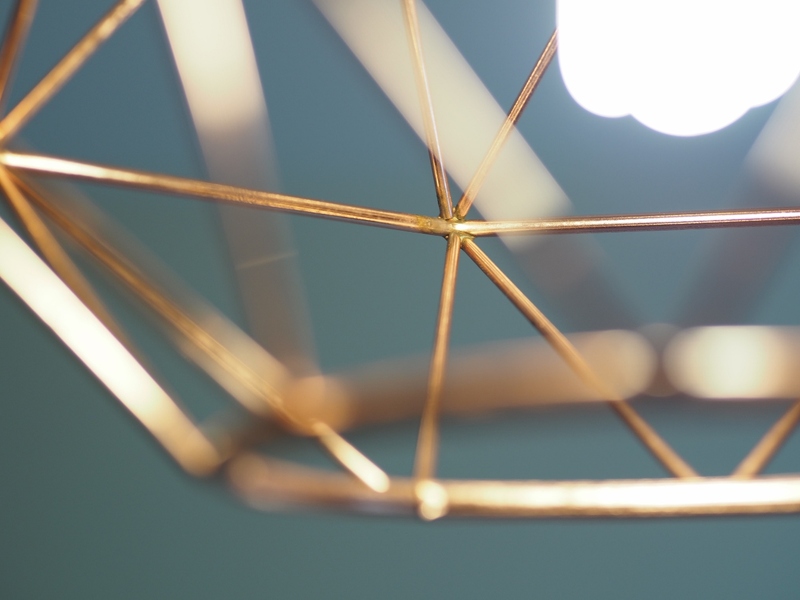 I love the gold light fixtures it reminds me of abstract modern art. What influenced the interior design of your room? I love this transformation! There is nothing more that I love than transforming rooms for the seasons and this is definitely a theme I would love to do next! Wonderful transformation! I love your lamps, the copper one is gorgeous!! I love your lamp it's rather fab. Who would have thought that magazines pilled up would make such a good table! 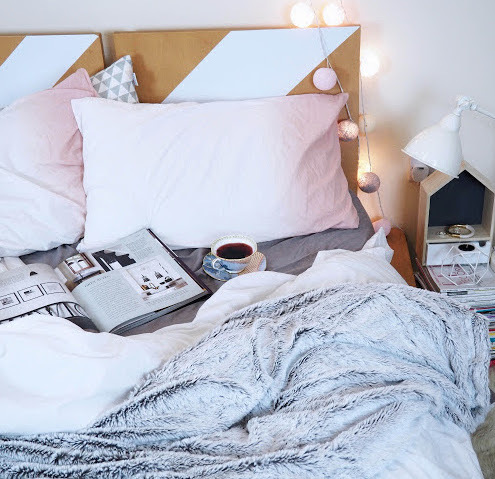 Wow it looks so cosy, such a great post! I love your styling. You really are my perfect idea of an interior designer. I love that light shade too! Amazing how just little touches can totally change the feel of the room, it looks great!